At the heart of Nueva Andalucia just 5 minutes from Puerto Banus and surrounded by the most prestigious golf courses. Magnificent dream villa, brand new, has 946 m2 distributed over 3 floors with elevator, very bright main room with high ceilings, fireplace lounge, dining room with beautiful mountain views and connected to the kitchen is fully equipped marked "Siematic", 5 bedrooms, 4 of them with bathrooms "en suite" and a guest toilet, laundry, multipurpose room and an area of 122 m2 semi-basement. 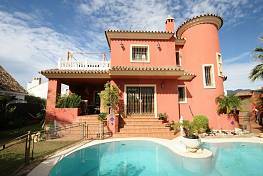 Villa is surrounded by a beautiful garden and private pool, terraces with beautiful sea and mountain views, garage for 4 cars. All rooms with individual air conditioning and under floor heating. The total plot is 1,200 m2 plus 110m2 of communal areas. 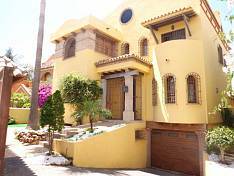 The property located in a gated development of 12 luxury villas with high security, as well as having watched the entire perimeter of the complex with a closed circuit security cameras 24 hours security guard has nightly 21.00 to 07.00 hours am.